Glace Bay’s Centre for Adults in Progressive Employment (CAPE) is a charitable, non-profit society that links persons with disabilities to the community through vocational education, interaction and personal skills building. The CAPE also works to educate the general public on the skills and abilities our participants possess. For over 20 years, the CAPE Centre for Adult Progressive Employment has worked in the Glace Bay community creating relationships between employers, community members and our participants. Our Society has assisted over 500 individuals through our innovative programs. 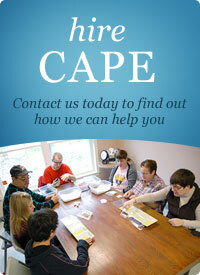 We encourage you to contact CAPE Society today for a complete look at all our programs and services! If you would like to make a donation to assist the CAPE Society and our mission, please feel free to contact us at 849-8187 or drop by the centre location on 40 Lower MacLean Street in Glace Bay. To donate online, please follow the link at the top of the page. My son has visual, mobility as well as mental disabilities and has been attending the CAPE Society (Brass Tacks Industries) for 14 years. When he turned 21 years of age, we did not know what we were going to do. Because of his limitations and need for constant supervision and support, he would never have a job in the community. When we discovered the CAPE, we found a miracle. Over the past number of years we have had several individuals from this agency volunteering with our organization. Most recently Mike has been coming on a weekly basis to assist with general cleaning duties. Besides benefiting from his help with building maintenance, we have grown to feel an important part of his life. When he first started with us he was withdrawn, and would stay to himself not talking. We now notice a very distinct change in Mike, as he now joins the group, participates, and even initiates conversations.